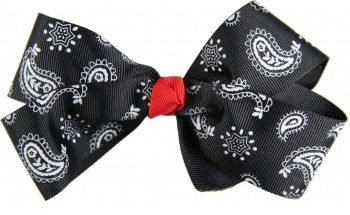 This bow is a Black and White paisley hair ribbon bound by a red grosgrain ribbon to give it some flare. This boutique style bow will perfect that black and white outfit. It is made of 1.5 inch grosgrain ribbon and is attached to a 2 inch French clip.